Nesocyrtosoma Marcuzzi is revised and many long-standing taxonomic problems are resolved. There are a total of 45 species in the genus Nesocyrtosoma, 27 of them are newly described herein (N. bestiola n. sp., N. neibaense n. sp., N. scabrosum n. sp., N. lacrima n. sp., N. simplex n. sp., N. altagracia n. sp., N. basilense n. sp., N. dolosum n. sp., N. purpureum n. sp., N. crenulatum n. sp., N. otus n. sp., N. darlingtoni n. sp., N. mutabile n. sp., N. larseni n. sp., N. bankense n. sp., N. fernandoi n. sp., N. garridoi n. sp., N. puertoricense n. sp., N. serratum n. sp., N. skelleyi n. sp., N. nearnsi n. sp., N. productum n. sp., N. teresitae n. sp., N. curvum n. sp., N. guerreroi n. sp., N. dentatum n. sp. and †N. minisculum n. sp.). Lectotypes are designated for Cnodalon elongatus Zayas, Cnodalon parallelus Zayas, Cnodalon tumefactum Zayas, Cnodalon turquinensis Zayas, Cnodalon inflatum Zayas and Cnodalon trinitatis Zayas. Cnodalon trinitatis Zayas is synonymized with Cyrtosoma (Nesocyrtosoma) inflatum Marcuzzi n. syn. Cnodalon inflatum Zayas is synonymized with Cyrtosoma (Nesocyrtosoma) tumefactum Marcuzzi n. syn. Cyrtosoma (Nesocyrtosoma) gebieni Marcuzzi is recognized for the first time as Nesocyrtosoma gebieni (Marcuzzi) n. comb. Cnodalon turquinensis Zayas, Cnodalon cuproso Zayas and Cnodalon elongatus Zayas are placed in Nesocyrtosoma and recognized as Nesocyrtosoma turquinense (Zayas) n. comb., Nesocyrtosoma cuprosum (Zayas) n. comb. and Nesocyrtosoma elongatum (Zayas) n. comb. Cyrtosoma (Nesocyrtosoma) ferruginea Garrido and Gutiérrez is recognized as Nesocyrtosoma ferruginea (Garrido and Gutiérrez) n. comb. Cyrtosoma (Pachycyrtosoma) Marcuzzi is synonymized with Nesocyrtosoma n. syn. Cyrtosoma (Pachycyrtosoma) merkli Marcuzzi is recognized as Nesocyrtosoma merkli (Marcuzzi) n. comb., and Cyrtosoma (Pachycyrtosoma) hispaniolae Marcuzzi is recognized as Nesocyrtosoma hispaniolae (Marcuzzi) n. comb. Serrania Garrido is synonymized with Nesocyrtosoma n. syn. Serrania viridula (Zayas) is synonymized with Platydema virens LaPorte and Brullé n. syn., and is recognized as Nesocyrtosoma virens (LaPorte and Brullé) n. comb. Apsida cubanensis (Kulzer) is placed in Nesocyrtosoma as Nesocyrtosoma cubanense (Kulzer) n. comb. All but two of the 18 previously known species of Nesocyrtosoma are redescribed, comparative descriptions of all species and species-groups are provided, all but three species are illustrated, distribution maps are presented, and a key to all species is supplied. A phylogenetic analysis is conducted to test the monophyly of Nesocyrtosoma. 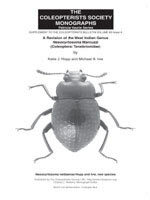 Finally, a review of Antillean biogeography and the biogeographic distribution of Nesocyrtosoma are discussed.